The United Nations asked the government of Sri Lanka on Friday to immediately repatriate the commander of its 200-strong contingent assigned to the U.N. peacekeeping force in Mali following a review of his human rights background. U.N. spokesman Stephane Dujarric announced Friday that the request for Lt. Col. Kalana Amunupure to leave the troubled West African nation was made “based on recently received information.” He gave no details. A report in The Guardian newspaper in July quoted a confidential report that claimed the Sri Lanka commander in Mali — who was not named — is alleged to have committed war crimes during the finale of Sri Lanka’s 26-year civil war against Tamil Tiger rebels that ended in 2009. It said the report was produced by the South-Africa based International Truth and Justice Project, and also cited other Sri Lankans taking part in U.N. peacekeeping operations. Sri Lanka’s U.N. Mission said the ambassador was not available to comment on the U.N. decision. UN Secretary-General Antonio Guterres asked the government of Sri Lanka to repatriate Lt. Col. Kalana Priyankara Lankamithra Amunupure after it discovered he was accused of war crimes during the Sri Lanka civil war, said the spokesman, Stephane Dujarric. “This decision to repatriate the commander was made by the United Nations following a review based on recently received information” in his human rights record, the spokesman said. Dujarric said that if the commander hasn’t already been sent back home he would be very shortly. The United Nations has asked Sri Lanka to replace Amunupure as soon as possible. The mission was established by a UN Security Council resolution in 2013 to support the political process and help to maintain security in the West Africa country. Asked if Amunupure had also been screened by Sri Lanka’s Human Rights Commission, the spokesman said only the commission “had no role in the decision” to seek repatriation. Sri Lanka has faced years of criticism for dismissing calls by the United Nations and foreign governments for an independent inquiry into alleged war crimes and other abuses committed by both sides during the civil war. The Tamil Tiger rebels were designated a terrorist organization after a wave of suicide bombings, and were also accused of using child soldiers and killing Tamil political rivals. 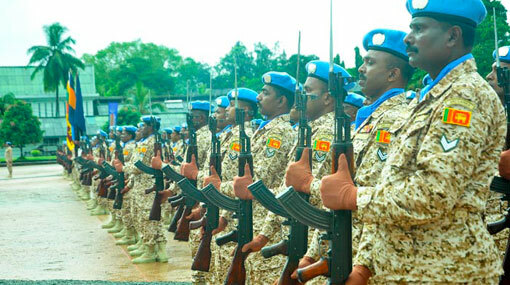 The International Truth and Justice Project said in a press release in April that it sent the U.N. a confidential list of more than 50 names of Sri Lankan paramilitary police from a Special Task Force that should be barred from participating in U.N. peacekeeping missions because they were either alleged perpetrators or frontline combatants at the end of the war when security force units reportedly committed systematic crimes.